The most common serious adverse event in the natalizumab group was multiple sclerosis relapse. For patients with secondary progressive multiple sclerosis, natalizumab was not superior to placebo for reducing disability progression, according to results published in Lancet Neurology. However, natalizumab did reduce progression on upper-limb disability progression. The study included participants age 18 to 58 years who had never taken natalizumab and who had secondary progressive multiple sclerosis for 2 years or more, disability progression unrelated to relapses in the previous year, and Expanded Disability Status Scale scores of 3.0 to 6.5 (n=889). Part 1 of the study was a phase 3, randomized, double-blind, placebo-controlled trial, and part 2 was an optional 2-year open-label extension. In part 1 of the study, participants from 163 sites in 17 countries were randomly assigned to receive 300 mg intravenous natalizumab (n=440) or placebo (n=449) every 4 weeks for 2 years. In part 1, the primary outcome was the proportion of patients with sustained disability progression, assessed by 1 or more of 3 measures: the Expanded Disability Status Scale, Timed 25-Foot Walk, and 9-Hole Peg Test. In part 2, the primary outcome was the incidence of adverse events and serious adverse events. In part 1, 44% (n=195) of participants treated with natalizumab had confirmed disability progression compared with 48% (n=214) of participants treated with placebo (odds ratio [OR], 0.86; 95% CI, 0.66-1.13; P =.287). The researchers did not observe any treatment effect on Expanded Disability Status Scale (OR, 1.06; 95% CI, 0.74-1.53; nominal P =.753) or Timed 25-Foot Walk (OR, 0.98; 95% CI, 0.74-1.30; nominal P =.914). Participants treated with natalizumab did have reduced 9-Hole Peg Test progression (OR, 0.56; 95% CI, 0.40-0.80; nominal P =.001). 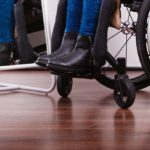 “Longer-term trials are needed to assess whether treatment of secondary progressive multiple sclerosis might produce benefits on additional disability components,” the researchers wrote.